Transform a former bulk fuel storage facility for residential reuse. 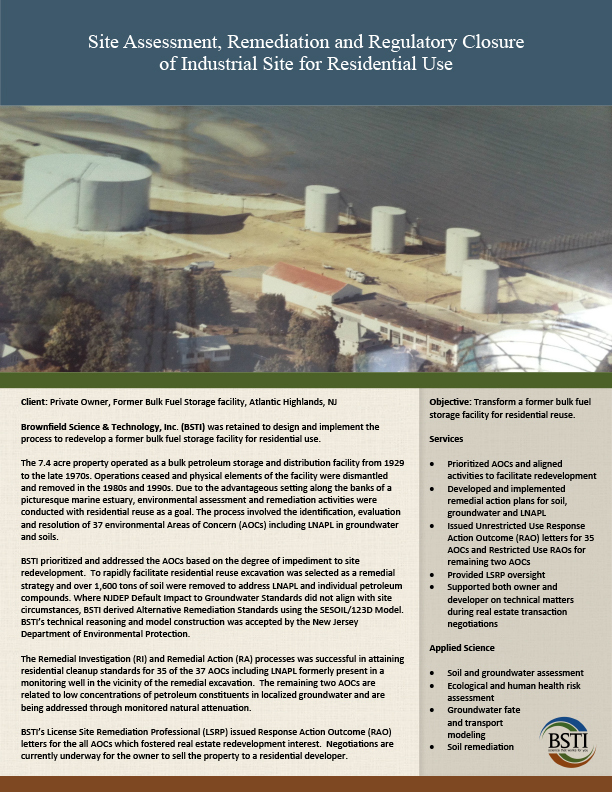 Brownfield Science & Technology, Inc. (BSTI) was retained to design and implement the process to redevelop a former bulk fuel storage facility for residential use. The 7.4 acre property operated as a bulk petroleum storage and distribution facility from 1929 to the late 1970s. Operations ceased and physical elements of the facility were dismantled and removed in the 1980s and 1990s. Due to the advantageous setting along the banks of a picturesque marine estuary, environmental assessment and remediation activities were conducted with residential reuse as a goal. The process involved the identification, evaluation and resolution of 37 environmental Areas of Concern (AOCs) including LNAPL in groundwater and soils. BSTI prioritized and addressed the AOCs based on the degree of impediment to site redevelopment. To rapidly facilitate residential reuse excavation was selected as a remedial strategy and over 1,600 tons of soil were removed to address LNAPL and individual petroleum compounds. Where NJDEP Default Impact to Groundwater Standards did not align with site circumstances, BSTI derived Alternative Remediation Standards using the SESOIL/123D Model. BSTI’s technical reasoning and model construction was accepted by the New Jersey Department of Environmental Protection. The Remedial Investigation (RI) and Remedial Action (RA) processes was successful in attaining residential cleanup standards for 35 of the 37 AOCs including LNAPL formerly present in a monitoring well in the vicinity of the remedial excavation. The remaining two AOCs are related to low concentrations of petroleum constituents in localized groundwater and are being addressed through monitored natural attenuation. BSTI’s License Site Remediation Professional (LSRP) issued Response Action Outcome (RAO) letters for the all AOCs which fostered real estate redevelopment interest. Negotiations are currently underway for the owner to sell the property to a residential developer.